The DIY Segway, probably definitely our most popular vehicle, which helped spawn a new era of smaller, lighter, cheaper, simpler DIY self-balancing...things. The Cap Kart, our largest, most ambitious vehicle, which underwent a revision in 2010. Its name comes from the 16V/110F capacitor that gives it a speed boost from a bit of regenerated energy. BWD Scooter, which led me in the direction of brushless motor design and control that occupies so much of my time these days. 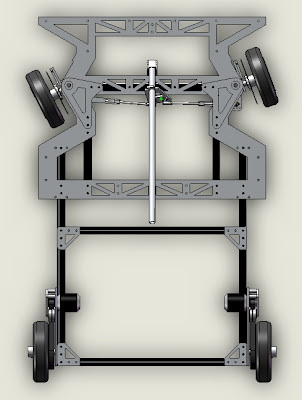 But for 2011, we are returning to four wheels to create an ultralight go-kart. (Okay, maybe not this ultralight.) One of the drawbacks of Cap Kart, even the newer, lighter version, is that it takes three people and a truck to move around. With tinyKart, the target weight is something like "less than one of Cap Kart's old batteries." 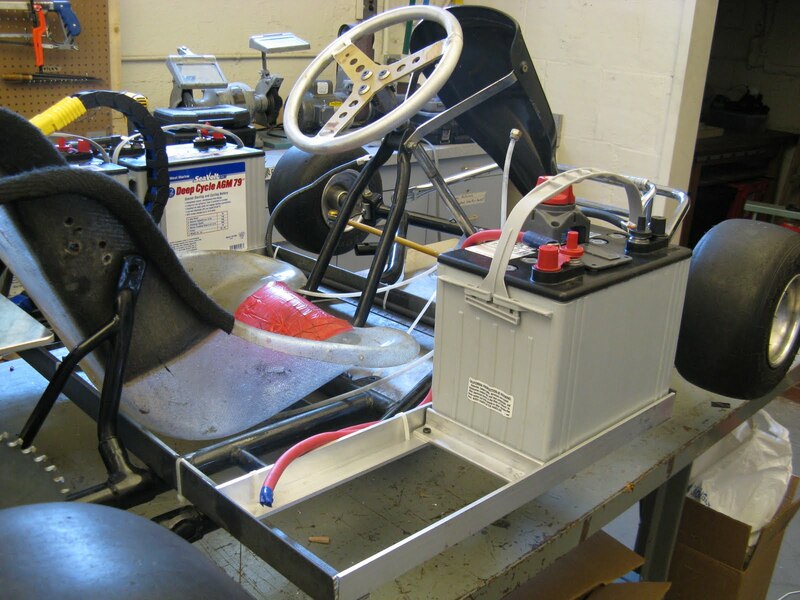 Cap Kart's original 53lb deep-cycle marine batteries. So obviously we're gonna need lighter batteries. 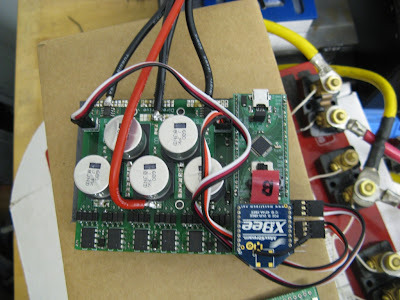 Cap Kart v2.0 uses 42lbs of LiFePO4 batteries from Thundersky, now Winston Battery Limited. 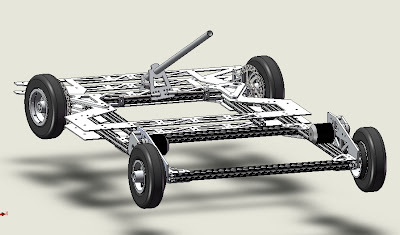 For that weight, you get 1.58kWh of energy storage and a peak power of 7.5kW. 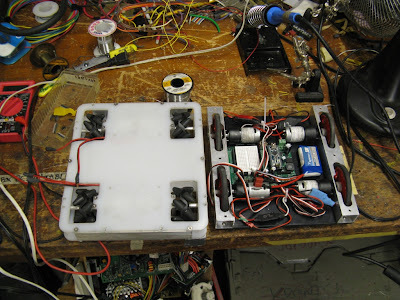 The only way to do better than that, in terms of power and energy density, is with lithium polymer. 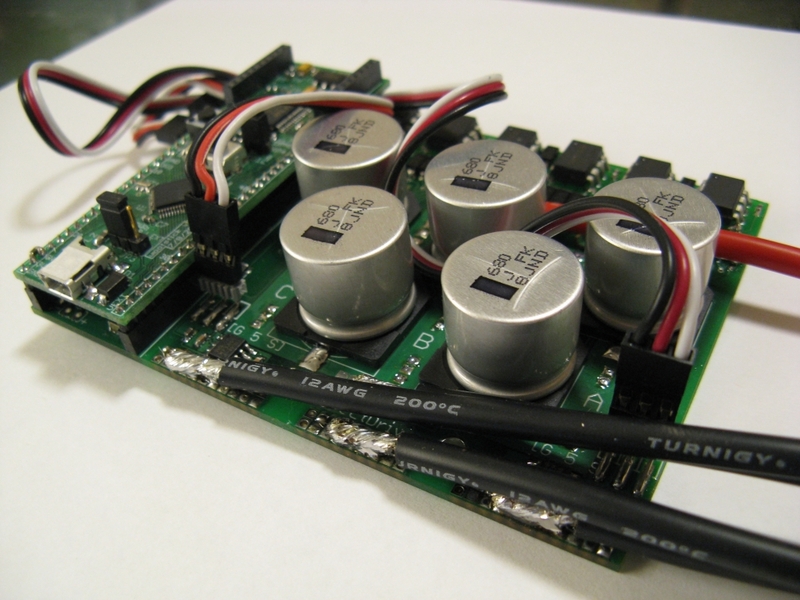 tinyKart will use between two and four 10S, 4500mAh LiPos, making it only marginally less of a fire hazard than a gas go-kart. 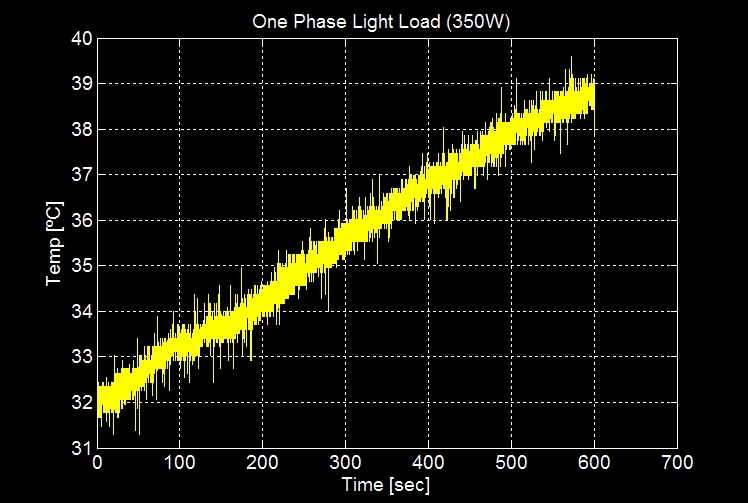 At a maximum, this gives 0.67kWh of energy storage. But since they specialize in absurdly high power density, there is the possibility of using just two batteries, a weight of just over 6lbs, to power the whole kart for a few minutes at a time. The drivetrain is really simple: RWD with independent belt drives on each wheel. 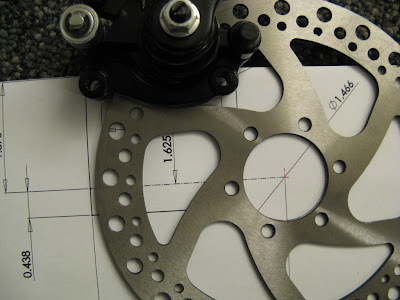 This is enabled by the cheap and light aluminum rims from electricscooterparts, which have a 72-tooth belt pulley integrated into the rim casting. The rim and tire together weigh less than 2lbs. 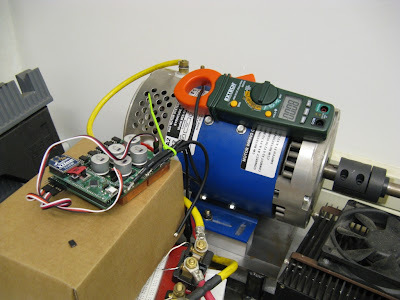 The motors are light enough to face-mount to a 1/4" aluminum plate and ball bearings on an eccentric standoff provide adjustable belt tension. As-pictured, the gear ratio is 4.5:1, yielding a top speed of about 30mph with the 8" wheel. These wheels are designed for electric scooter use, where they would fit on 10mm shafts supported on both sides by the rear fork of a scooter. One of the easily-overlooked little details that I think makes this all possible is 6903 bearings. These are the same O.D. (30mm) as the 6200 bearings normally used in these rims, but they have a 17mm I.D. instead of 10mm. Thus tinyKart's four wheels are supported by cantilevered 17mm aluminum shafts. 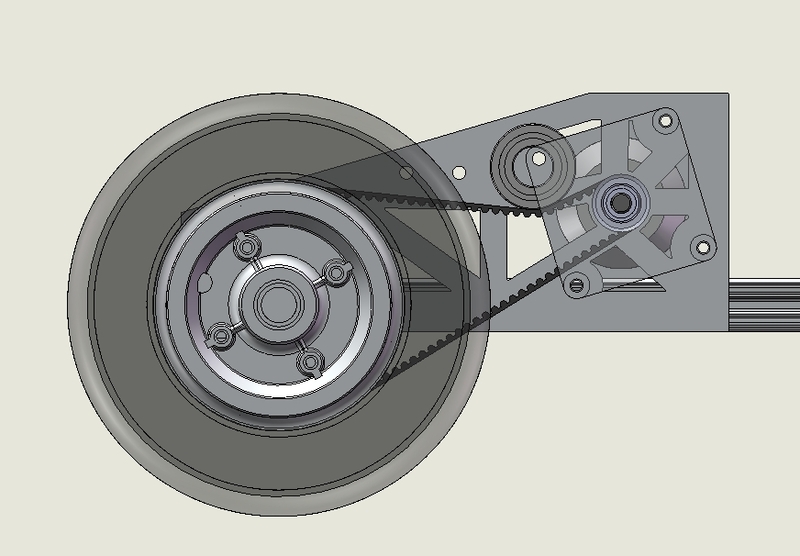 One of the things I've always had in mind for an independent RWD electric kart is torque vectoring, a neat trick where you force more current into the motor driving the outside wheel to help shove the vehicle into the turn. This of course requires measurement of the steering wheel angle, but that's not hard. It might make up for the natural understeer of a kart that has 70+% of its weight on the rear wheels. 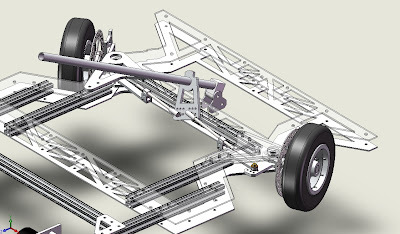 Between all of us, we have a ton of experience building electrically-propelled drivetrains, so I'm not very worried about the propulsion side of things. What makes this project interesting is that, unlike Cap Kart, we're building the entire chassis from scratch. 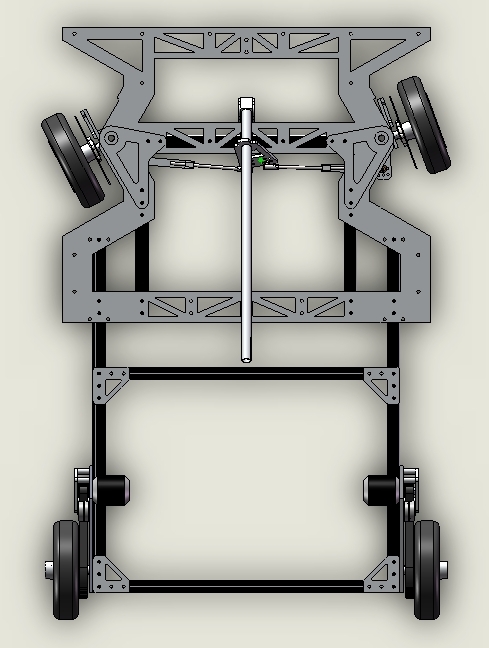 And as you can probably tell from the CAD, it is not a typical go-kart build. 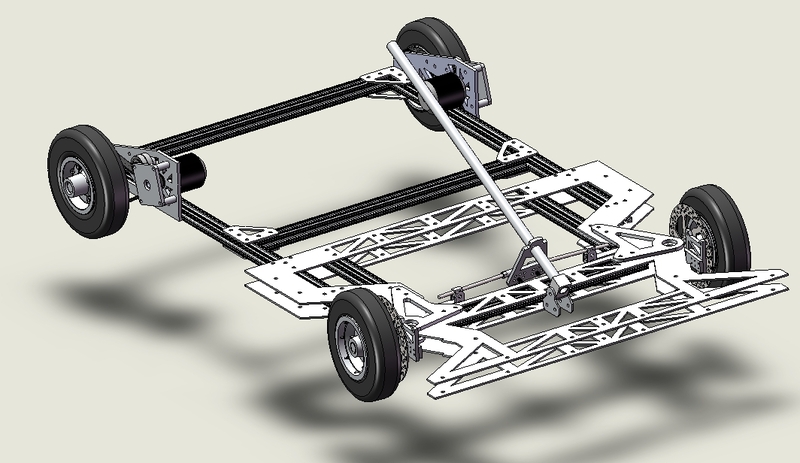 We briefly debated the idea of making a welded tube frame, but then decided that 80/20 is the only structural material we know how to utilize ultimate expression of lightweight structural modularity. The kart chassis is split into two halves: the front, which has a lot of platework for aligning steering linkages, and the back, which contains drivetrain components and the seat. 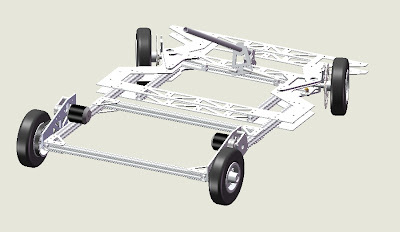 The overall width is about 34" and the length is 48", though it can easily be made an few inches longer or shorter to accommodate different drivers. The front and back overlap by an adjustable amount to provide rigidity. 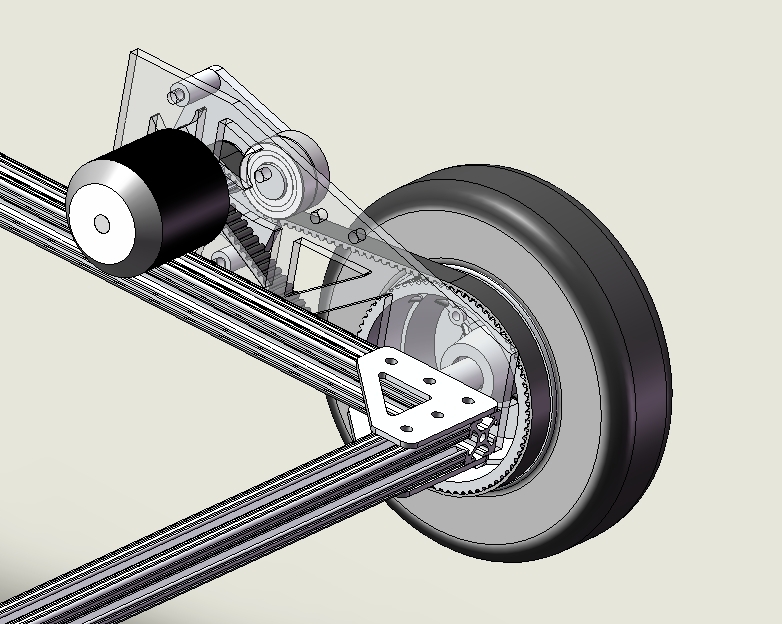 The front wheels are also electricscooterparts rims, but with brake disks instead of drive pulleys. 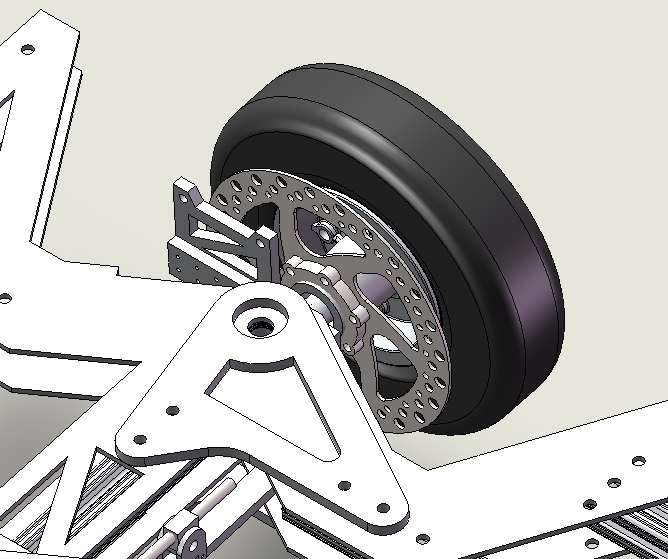 We'll machine off the drive pulleys on those wheels and face the brake mount inwards. This will cause a bit of an issue on the left side, since the brake disk hubs are threaded and the braking force will tend to unscrew that side's hub. But I suspect this problem is easy to solve with enough Loctite. 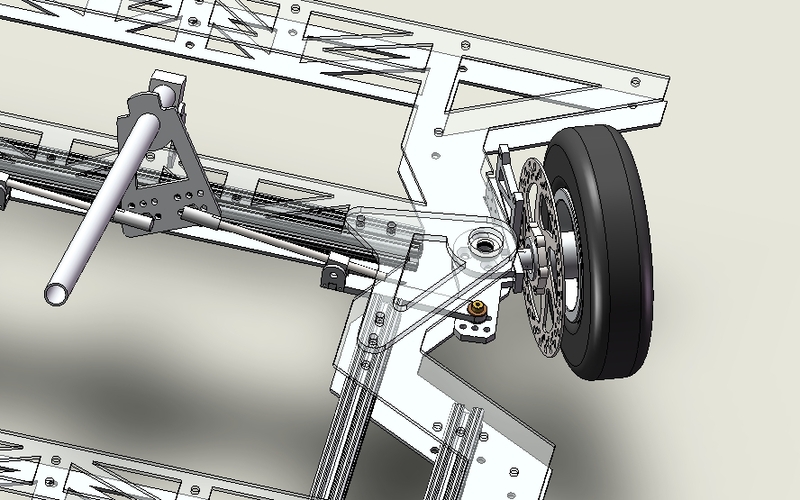 The other tricky bit of geometry to solve in the front of the kart was the steering linkage. The horizontal pin joint is just a shoulder screw with some brass washers. The vertical pin joint, which is far enough inside the kart not to interfere with the plates, attaches to threaded rod that goes to the drive plate on the steering column. Since I know nothing about proper steering geometry, everything is adjustable. The only thing we've sacrificed from Cap Kart's steering is the caster angle, which is by necessity zero in this design. To make up for it (or do nothing at all, idk), the center of the front wheels is just slightly behind the kingpin pivots. 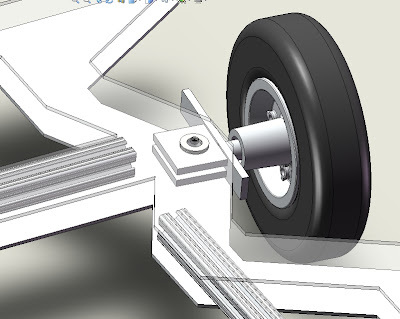 Since the 1/8" aluminum plates don't really provide much rigidity, the gap between the 80/20 rails framing the front of the kart are spanned above and below by 1/4" steering reinforcement plates, which also hold the radial kingpin bearings. The thrust bearings are between the 1/8" plates. It might be overkill, but flimsy steering is one failure that we don't want to deal with. There are plenty of other little details that went into the design so far, but I'm sure we'll be highlighting them as they get built. For now, we're waiting on parts and I'm on my first real vacation in a long time. The build begins next week and it will drive by mid-August. This quick fix brings the coupling down to tolerable levels for moving on to other testing. I'm amazed at how close the actual gains are (~15LSB/A) to what the first coupling matrix came up with. I guess linear algebra does work. With these gains, the maximum phase current that can be sensed is about 100A, so if I make it past that mark I will have to reconfigure the traces for a less sensitive current measurement. At that point, I will need bigger wires anyway. I'm still leaning towards a return to the ACS714 integrated-conductor Hall effect current sensors, but before I give up on the through-the-board sensors, I will also try shielding the wires and/or sensors in such a way that they can only pick up the field from the traces passing under them. 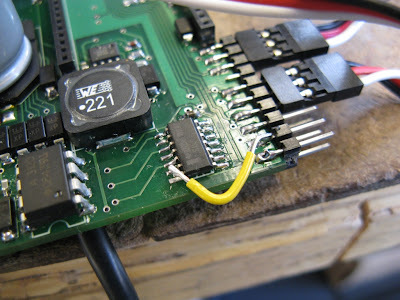 Then, I may be able to re-route the wires the way I want, which is off the side of the board. The next milestone was a light load test on a single phase with a current-limited bench supply. 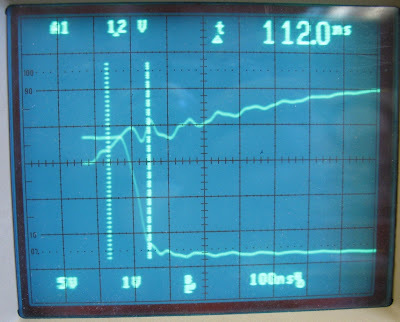 Using the SepEx motor field as a giant thermal sink, I ran one phase for 10 minutes at about 350W (48V/7.5A in, 24V/15A out) with passive heat sinking only. No problems passing this test. The temperature reading was clean and the rate of temperature rise on the sink was a mere 0.5ºC/min. Ballpark thermal estimates (the only type I can do) suggest this is reasonable for such a light load. It's literally not possible to capture the sound of an F1 car passing 15 feet in front of you with my camera. The microphone just saturates and it just sounds like an explosion. Then again, that's sort-of what it sounds like in real life too, when your eardrum saturates. Combine the sound with the ominous sprays of water shooting 20 feet above the treeline on the far side of the track and it's like something out of a monster movie: You know it's coming for you next. Max has a more thorough summary of the experience, plus some better video. But since we ran into car trouble (lol) on the way back from Montreal, I've had to spend a few days catching up with work. I made a bit of progress on some projects before and after the weekend, but not enough to justify an entire post for any individual one. So, I will do the thing I hate doing and make a Pan-Project Update to make excuses for highlight the lack of progress on each. I've made no progress on this. I have a decent idea of how to start, and I maintain my opinion that you can do pretty much anything in software if you spend enough time messing with it. Some day soon I will do it, and nobody will care because it's software and has no tangible meaning, but then I'll just laugh at everyone. In fact, as a starting point I just transfered mini4WDbot's entire electrical system over to Flinch. That includes four repurposed VS-11 servo drivers, an Arduino Nano Carrier, and a 7.4V LiPo. 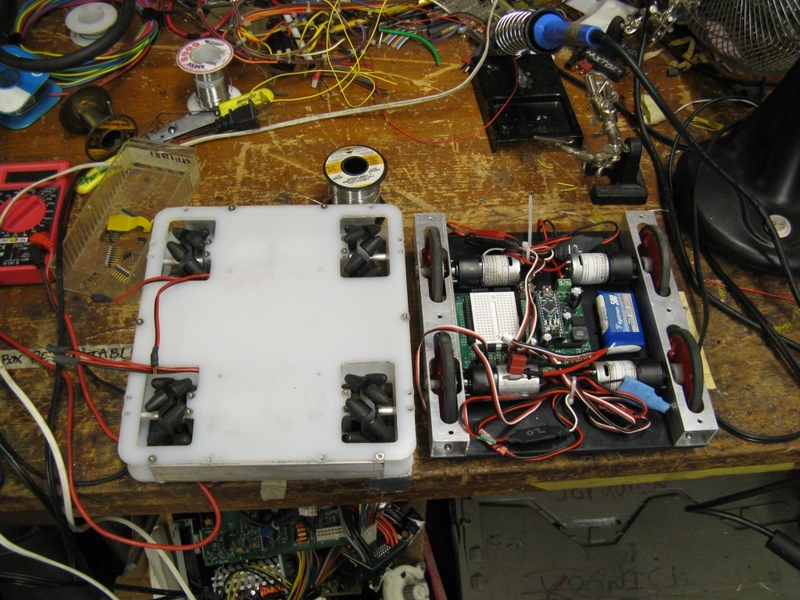 I wanted to test the open-loop performance of the FingerTech mini-Mecanum wheels before investing significant effort into the inertial sensors for high-speed Mecanum-ing. Unfortunately the low-speed tests didn't work out so well. I've worked with larger Mecanum wheels before and even those are very sensitive to weight distribution, driving surface, and the condition of the rollers. The rollers on these wheels are rubber with brass axles riding in plastic wheel hubs. Off the ground, they roll just fine. But under axial loading, the steel washer spacing the rubber roller out from the wheel does not make a very good thrust bearing. Maybe with a lot of tweaking they might do something Mecanum-like, but I don't have the patience for that. 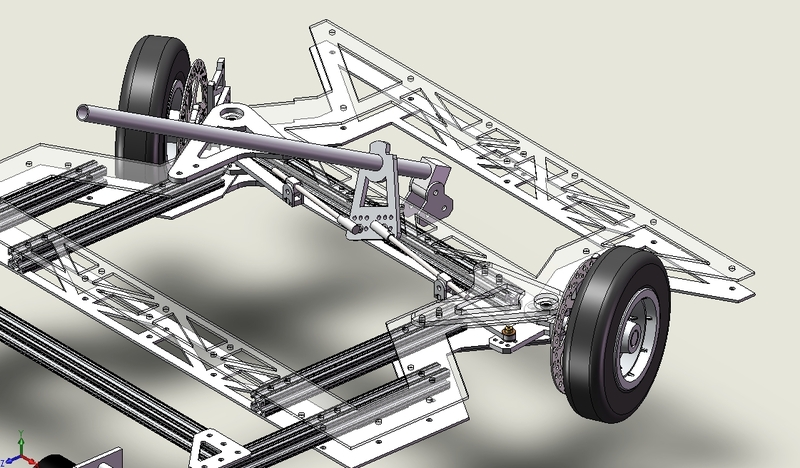 Plan B involves putting real rolling-contact bearings on each roller axle. FingerTech sells these (an implicit admission that the regular axles leave something to be desired? ), but they're needle bearings, which won't help much with friction between axial-contact surfaces. So I instead opted for SR144ZZ tiny ball bearings. At least with these I can use tiny shaft spacers to keep the washer from making contact with the side of the wheel. Of course, this means carefully drilling out each roller axle and pressing/gluing in a tiny bearing. After that, another open-loop test to evaluate the new level of Mecanumosity. Step 1: Apply paste haphazardly without a stencil. Step 2: Place MOSFETs in the correct orientation. Step 3: Toast for 7 minutes or until lightly browned. 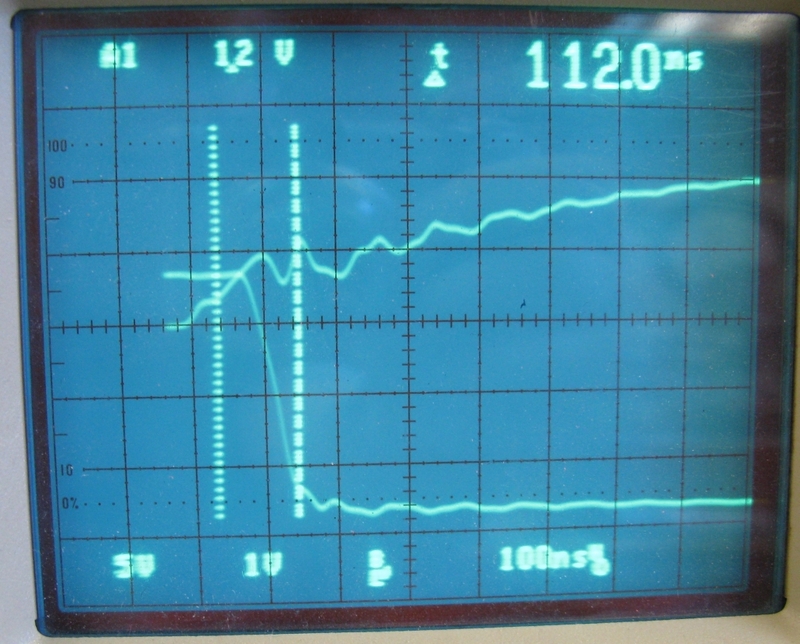 DirectFETs are ever so slightly magnetic. 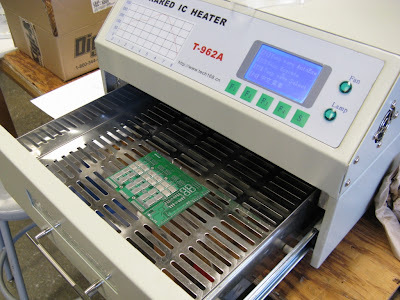 This is great because you can pick them up with a small neodymium magnet (instead of tweezers) and carefully lower them onto the paste. Once they touch the paste, surface adhesion is enough to pull them off the magnet. 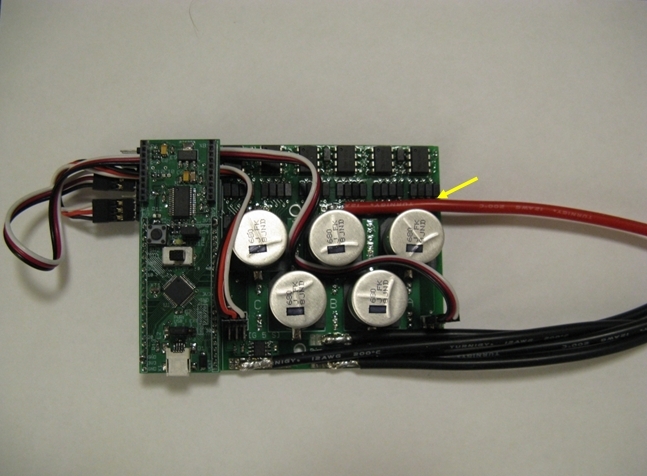 You can look at the board edge-on to verify that there is still a gap between the gate and the nearest row of source pads. If not, you probably want to clean off that one and try placing it again. 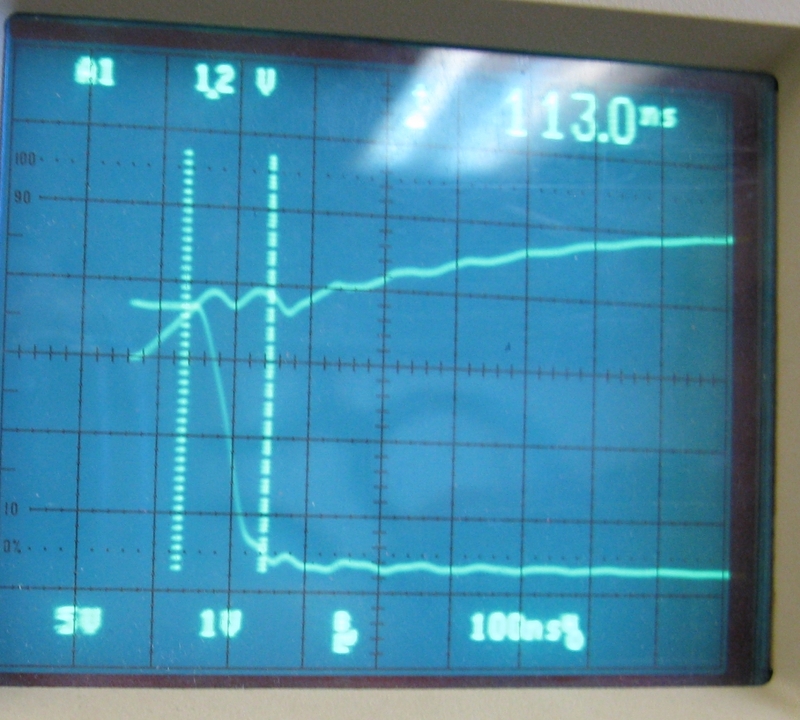 After reflow, this gap is usually still visible. 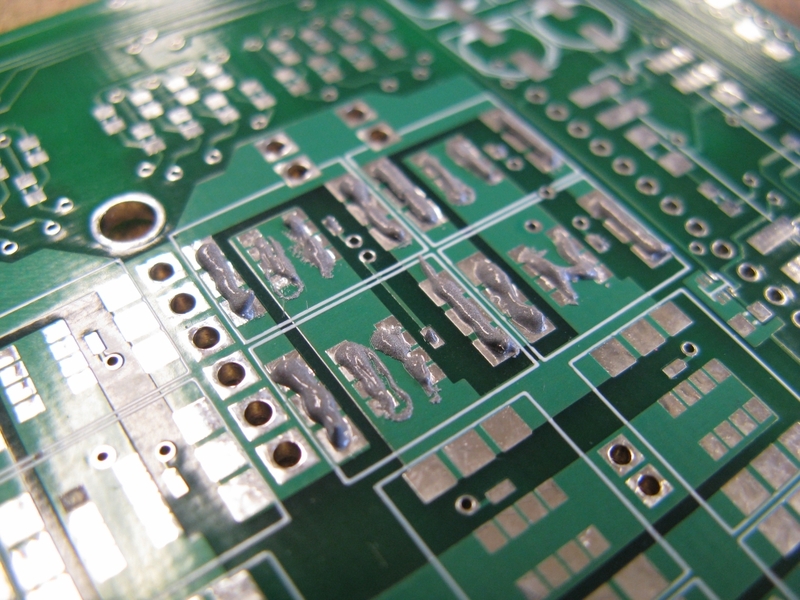 I did see a few after reflow where the gap was no longer visible. But upon measurement, they did not appear to be shorted. The drain tabs and source pads need a lot of paste. Screw stencils.You can lay down a thick line. It's got to conduct a lot of current anyway, and much of the volume of the paste is flux, so it gets thinner as it evaporates. 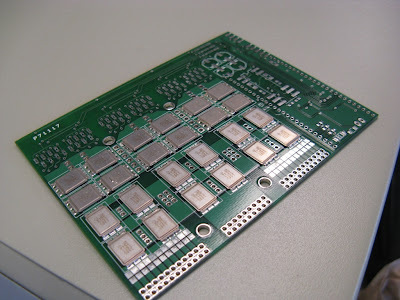 It's not like a BGA IC where you have to worry about shorting adjacent balls. 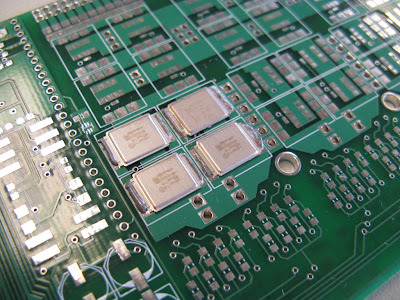 There is only one critical point (between the gate and source) and by preferentially steering the line of solder paste toward the far side of the source pads, you can avoid bridging that. 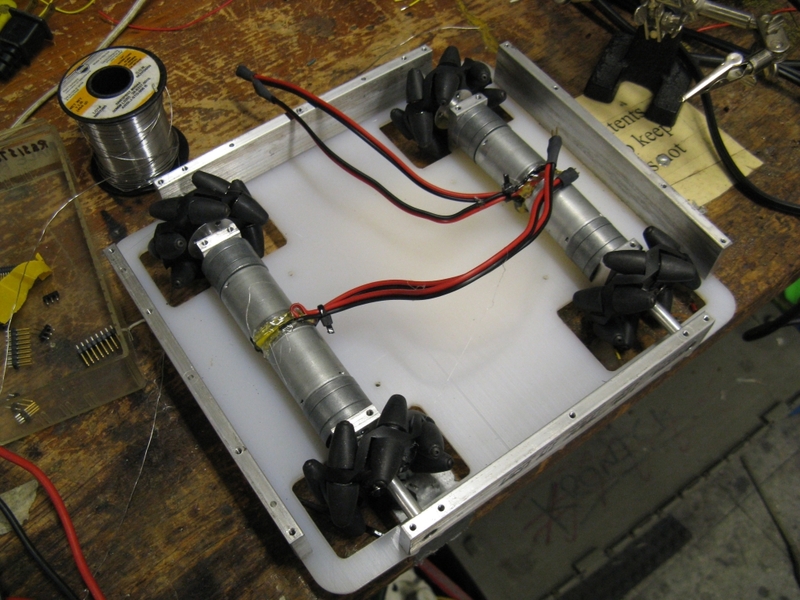 You can and should test the MOSFETs after they have been reflowed. I test to make sure there are no shorts from gate to drain or gate to source. (If you shorted drain to source, you did something terribly wrong.) 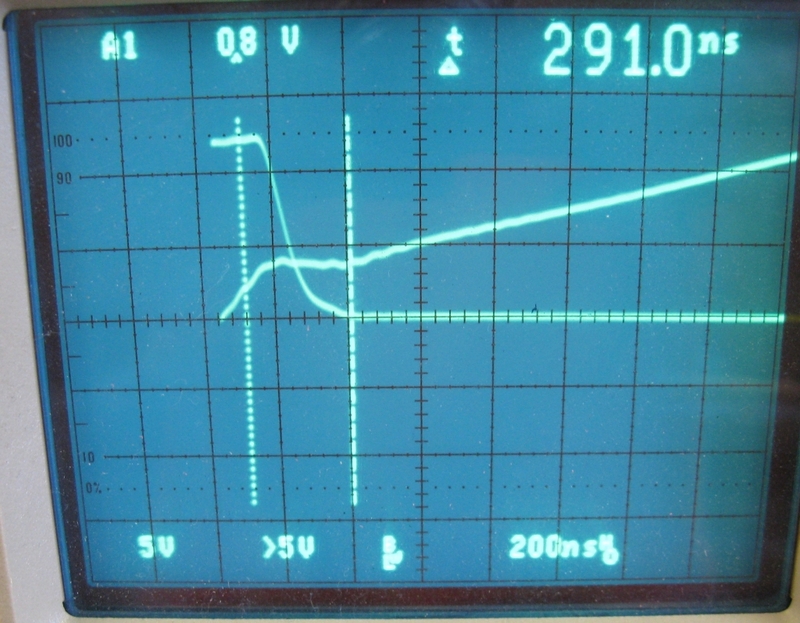 I also check the capacitance from gate to source, which should be near the datasheet spec and consistent across all FETs. And finally I check the on-state resistance. As far as alignment goes, some of the FETs are visibly rotated by a few degrees. 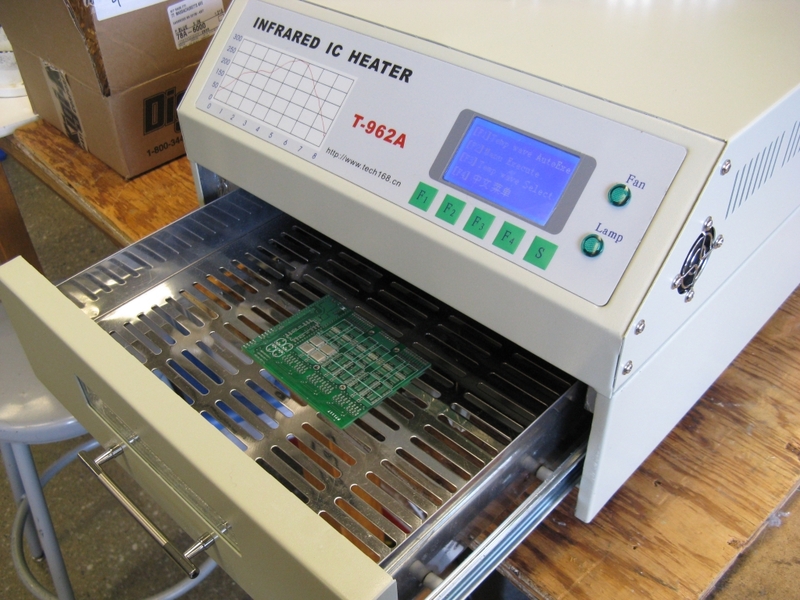 However, they are very flat, something I was concerned about for heat sinking. 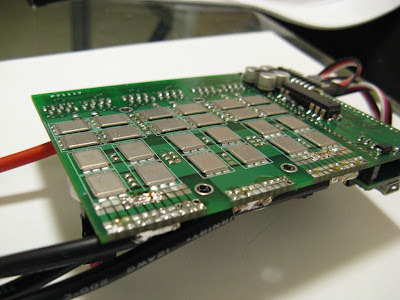 I'm happy with the procedure and will be even more confident in recommending it after I load test this board. 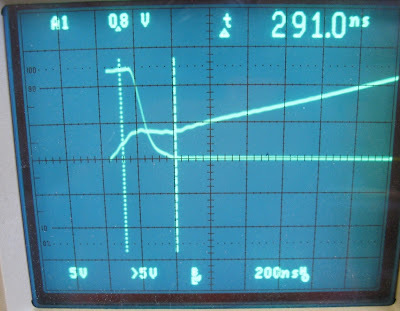 One minor problem was that the ACNW-3190 gate drivers that I was so excited about last post turned out to be 400mil DIP packages instead of 300mil. I should have RTFDS more carefully. Anyway, that means I will have to go back to the 2.5A HCPL-3120 drivers. Though maybe I can, you know, stack them on top of each other or something.